China Hour includes programmes about Chinese plants and gardens made all over China. Coming soon: Gordon. Jack and a team of garden enthusiasts try growing Chinese vegetable in the UK. They report back on how It’s all going and what they taste like. A native to China -this is one of my favorite plants it’s less vigorous than its popular relative Virginia creeper. Here in the UK it is an extremely versatile specimine that can tolerate most conditions and is relatively easy to look after. It is ideally suited for smaller gardens, growing up boundary fences or trellis work where it will quickly cover an awkward area, such as a north or east-facing wall. The foliage has amazing deep red autumn colour which provides a fantastic show, in spring and summer, its leaves are very pretty - deeply divided, velvety and dark green with prominent white and pink veins. Growing to 10 m (33 ft) the large palmate leaves consist of five to nine oval leaflets, each up to 12 cm (5 in) long, with its strong white veining. Clusters of inconspicuous flowers in summer may be followed by black fruits. This climber is a brilliant option for that difficult corner in the garden. It can be used for covering up ugly faciers and screening boundaries, it’s also great because it can tolerate shady conditions. The show piece, is the wonderful autumn colour that differently wont disappoint! But the name is a bit of a giveaway- it is of course a Chinese native. It’s a wonderful climber and produces a vast array of long fragrant hanging flowers in spring and early summer. It is a large deciduous specimen with hardwood twining stems that support the plant’s growth The wisteria’s leaves are dark green and pinnate , the drooping racemes of flowers can be 30cm in length, and open before the leaves. They are best grown in partial shade and the plant will naturally grow towards the sunlight. The pea-like mauve, lilac or white blooms can be highly scented and are a good attraction for bees and wildlife. Wisterias can grow up to 10 metres in height, with the supporting stems getting to 30cm across. This plant is an extremely showy specimen, which works incredibly well climbing up and rambling over a pergola. The intricate flowers provide an absolute show, while the summer foliage is great for shade. This specimen is evergreen and retains its foliage during the winter months, which makes it such a great choice for brightening up a dull area. Chinese Witch Hazel will do best in a slightly sheltered spot in full sun on well drained soil. The flowers of Loropetalum chinensis rubrum 'Fire Dance' are also delicately scented,and will provide a great backdrop to any border. 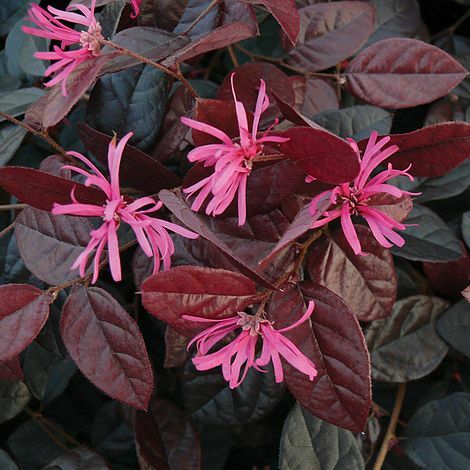 Loropetalum is such an underated plant in my opinion, this brilliant evergreen option creates fantastic structure and interest in borders all year round. The purple/bronze foliage a provides a great backdrop for perennial planting. Chinese lanterns can light up a garden with their brilliant blooms and interesting foliage. The abutilons come in many different forms and shapes, recognisable for their maple like leaves and colourful five petaled flowers that resemble hanging lanterns, hence how they got the name Chinese lanterns. They tend to grow well in partial shade, in free draining soil. Many specimens of Abutilons are slightly frost tender and are not a fan of cold and wet conditions. This group of plants consists of small trees, shrubs, and vines. However, their name is a little misleading, as they aren't solely Asiatic in origin. In fact, there are about 200 species in the Abutilon genus. The name Abutilon comes from the Arabic word “aubutilun.” It was given to the plants by a Persian physician and astronomer named Avicenna (c. 980 — 1037), Plants in the Abutilon genus typically grow to around 10 feet tall. Abutilon shrubs and trees can either be multi-stemmed or grow from a single stem, with multi-stem growth being more desirable when growing garden screens and hedges. Their leaves can be simple with entire margins or lobed like a maple's . Chinese lanterns do best in humus-rich, well-drained soil, but they can also grow in different environments depending on the location. Different Abutilon species also require different amounts of light. In hot climates, these plants actually do better in full shade than they do in direct sunlight. They really like moist soils and hate drying out, so regular watering during the growing season is essential for good growth. Gardeners should cut back on watering in any areas that receive extensive winter rains to prevent these plants from being oversaturated. These abuliton come in all shapes and sizes, some specimens are grow as a deciduous shrub, while others like to ramble up pergolas and trellis work. It’s an extremely attractive, easy and quick growing specimen that can add such an architectural presence into any garden. It is one of the hardiest palm trees and can grow down to temperatures of minus 10. It prefers to be sheltered from strong winds to prevent frond damage. Beautiful fan shaped fronds are arranged around the top of a single trunk which is covered in coarse fibrous material, providing that tropical and exotic appearance. Branched flower heads appear from early summer. The trunks can be stripped back to the hard wood exposing a yellowy and brown stem. This palm is one of the best options for the UK if you want a hardy palm that grows in most sunny conditions. It’s extremely good at providing that architectural feel in a garden, they also look incredible with their stems stripped and lit up with lighting. The don’t grow ridiculously fast, so maintenance is minimal. The prefer to be planted out of the wind.